Peppermint oil is an essential oil that has been praised for helping your hair growth. For many years, peppermint oil has been used as a successful treatment for hair growth. It is one of the most concentrated, and most intense essential oils. The main ingredient in peppermint oil is menthol, which is why the oil provides a distinct cooling and refreshing sensation. You can notice this sensation whether you ingest peppermint, or apply it topically to your scalp or any skin area. Peppermint oil works similarly to other essential oils for hair growth. The oil helps by stimulating and increasing blood circulation around the scalp. And when your blood is flowing, your body delivers more nutrients to the hair follicles. 2 What the science says? You are probably wondering, why use peppermint oil for hair growth. And it is a valid question. Therefore, we want to explain the benefits of peppermint oil before we talk about how and why to use it. Nowadays, many people use peppermint oil as part of their beauty and hair care routine. Thanks to its pleasant fragrance, peppermint oil has made its way into shampoos, skin creams, and many other hair and beauty products. How does peppermint oil help? As we said before, the main benefit is that the oil stimulates blood circulation. Peppermint oil can also help with dryness, itching, dandruff, and other scalp problems. In terms of hair loss, menthol is what helps. Menthol is essentially a vasodilator, a term we use when something improves blood flow. In most cases of baldness and hair loss, be it in women or men, it happens due to starved blood flow to hair follicles. Increasing circulation is one of the best ways to stimulate healthy hair growth. We know that peppermint oil is a common ingredient in shampoos, cleansers, bath products, lotions, and many other hair and beauty products. And that the benefits of the oil go beyond cosmetics. In the past several years, scientists have tried to explain and prove the benefits of peppermint essential oil. Now, the research is limited, but there is some evidence that the oil can be used as a hair growth treatment. The first study regarding peppermint oil for hair growth was published in Toxicological Research. According to the study, a solution of peppermint oil promotes hair growth. Even more important, the study showed peppermint oil produced better results than minoxidil, a common hair growth product approved by the Food and Drug Administration. 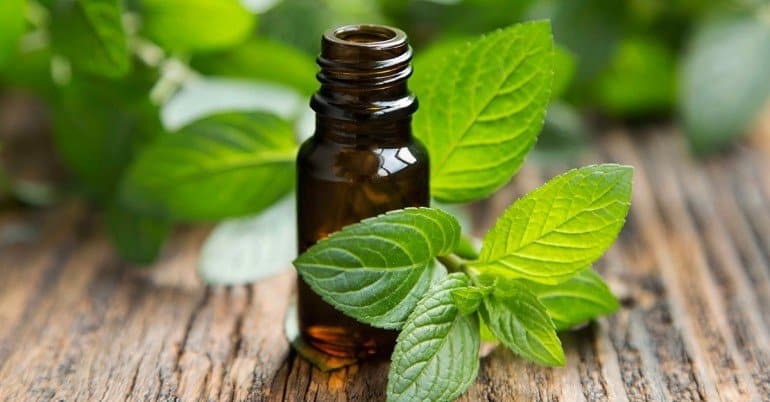 The study comments that menthol, which is the main ingredient in peppermint oil, has the ability to increase blood flow to the area where it is applied. Another study, published in Microvascular Research, also showed that a 4% menthol solution causes blood vessels to widen, which effectively increases blood flow. Now, this has not been linked directly to hair growth, but it proves the theory that peppermint oil increases blood flow to hair follicles and stimulates healthy hair growth. There are two common ways how to use peppermint oil for hair growth. We will explain both of them, and tell you how to properly apply the oil. The simplest way to use peppermint oil is with a scalp massage. This is the most direct way to reap the benefits of the oil. Warning: you have to dilute the oil. We mentioned previously that peppermint oil is one of the most concentrated and intense oils. That is why it is crucial that you dilute the oil with a carrier oil before you do a scalp massage. The best ratio is 2 drops of peppermint oil to one tablespoon of carrier oil. You can use coconut, olive, sweet almond, or jojoba oil as your carrier oil. Rub the mixture into your scalp for 30 seconds, and if the tingling is too intense, add more carrier oil. Leave the mixture to works its magic for 20 minutes on your hair. Rinse thoroughly afterward. Be careful to avoid peppermint oil around the eyes. Another way to use peppermint oil is to add it to your regular shampoo or conditioner. Again, you need just small amounts of the oil. Aim for 4 to 6 drops of peppermint oil for every ounce of shampoo. Shake well. Once your shampoo is ready, just massage your hair with it. Pay extra attention to your scalp. At first, you might notice some tingling sensation, but it shouldn’t be too much. Add more shampoo if the tingling is too much. Peppermint oil shampoo should not cause any irritation. If you notice any irritation, you should stop using it. In addition to helping stimulate healthy hair growth, a peppermint oil shampoo will give you extra fresh scent and make your hair feel alive. Remember, a tingling sensation means your oil is too strong, and you need more shampoo. The Food and Drug Administration classifies peppermint oil as “generally recognized as safe”, or GRAS grade. Peppermint oil is not toxic when used in small doses. Yes, high doses of peppermint oil can do harm to your skin, body, and hair. You have to remember that essential oils are very concentrated, and peppermint is among the most concentrated. That means that little goes a long way. Which is why we always recommend diluting peppermint oil with a carrier oil. You should never use peppermint oil in its full strength on your skin or scalp. Peppermint should also not be applied to the face or chest of babies or children, as it can cause breathing problems when they inhale menthol. Avoid applying the oil to sensitive skin around the eyes and to the eyes. If peppermint oil causes any tingling sensation, burning sensation, or irritation, stop using the product.